Hi friends! I hope that you are well. I've been better. Not going to lie. Fingers crossed that I'll be a-okay for Halloween. Today, I'm doing an extremely overdue blog post. 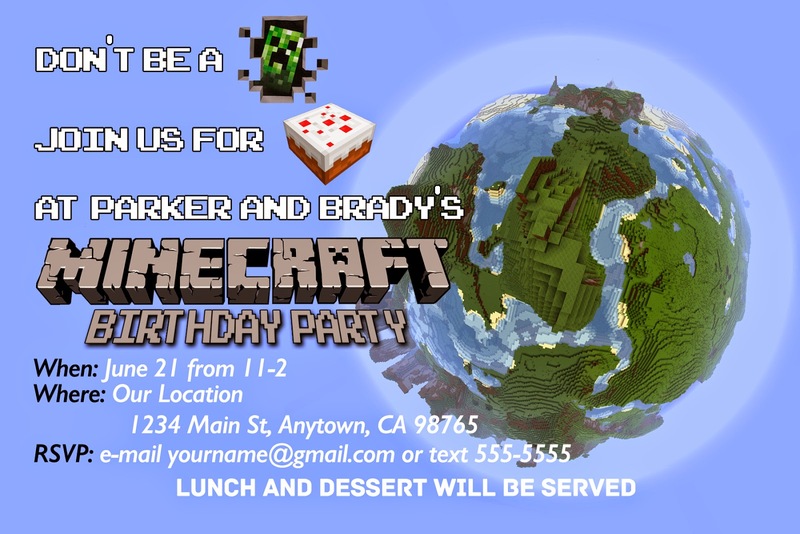 I'm posting about the boys's Minecraft Birthday Party that happened four months ago. I don't know why but I always drag my feel on blogging about parties. I think it's all the editing photos and figuring out what I want to say about the crafts. Also, let's take a moment to mention that I know NOTHING about Minecraft. I had to run these things by D and the boys to make sure they were in the game. If I say something wrong about the game, I'm sorry. Ok, here we go! As per usual, Dustin made the invite. Honestly, it was nicer when he made it but I went in and edited out our personal information and made it not as good. But you get the idea. Sorry for the blurry picture. Actually, none of these are pictures I took. I get really overwhelmed doing everything for a party that I forget to take pictures. Brady wanted a portal into the party. Apparently, Minecraft has portals. 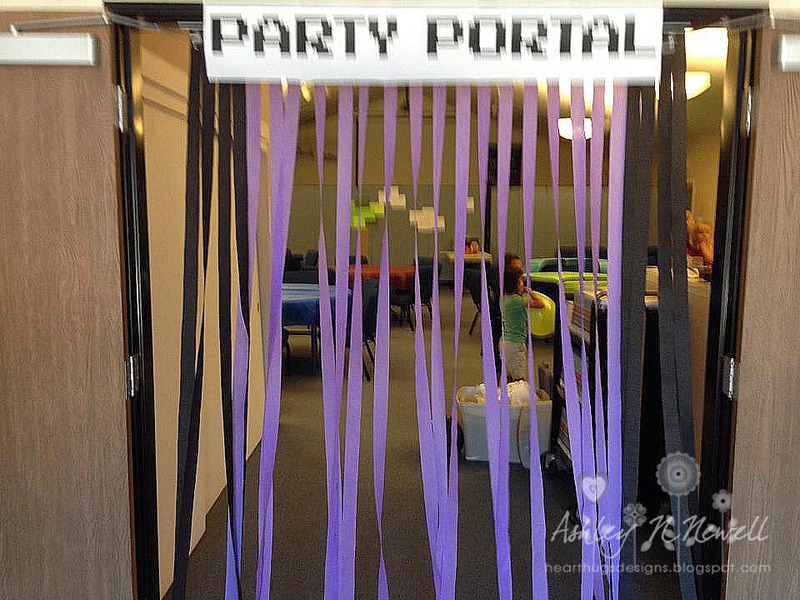 Dustin printed out the sign in this font he found and then we used black and purple streamers to make it look like the portal. 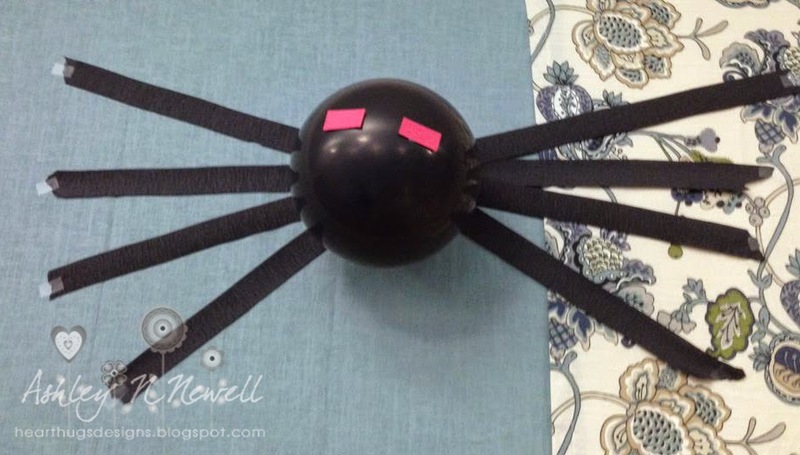 Also for decoration, we had these spiders. It's just a black balloon and I cut out red rectangles for the eyes. Then D did the legs with streamer. 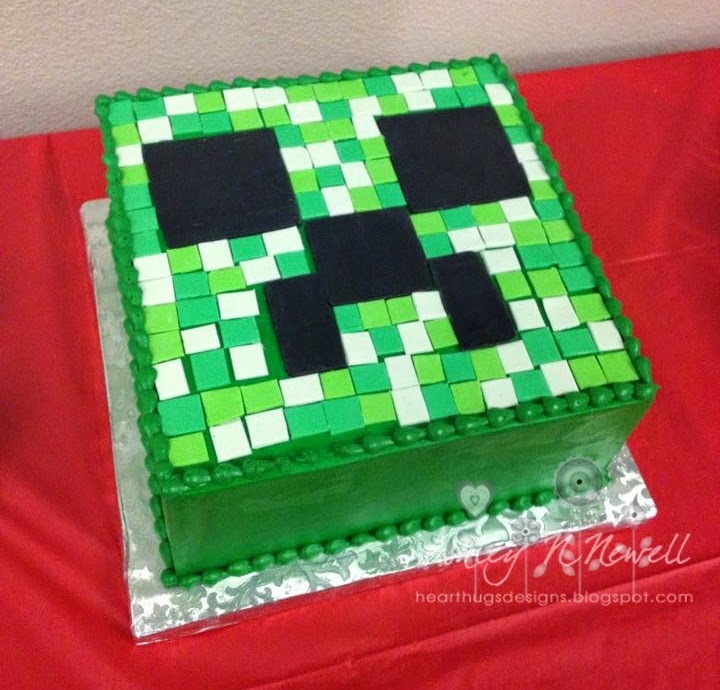 For food, we had all food that could be found in Minecraft or food that looks like things from Minecraft. 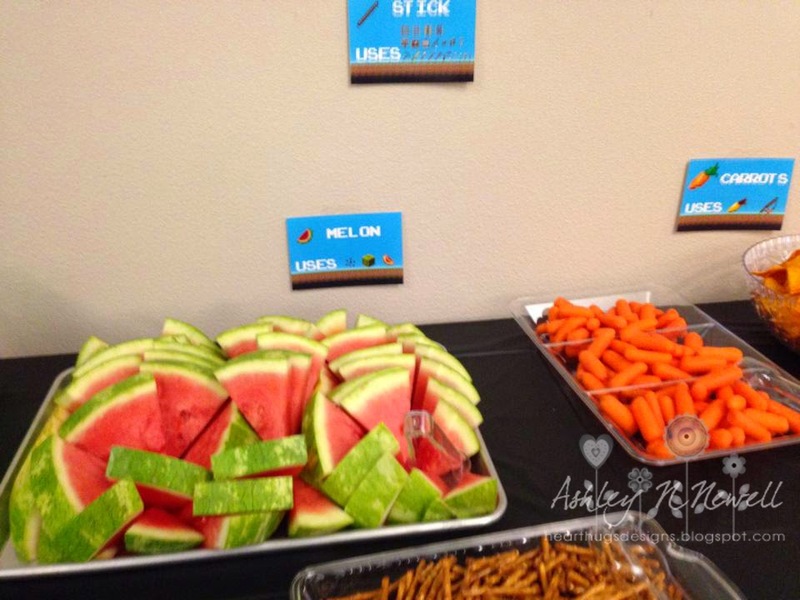 For example, we had pretzel sticks for sticks, we had gold wrap chocolate pieces from gold ingot, swedish fish for fish, etc... D created signs for all the food including what you can use them for in Minecraft. 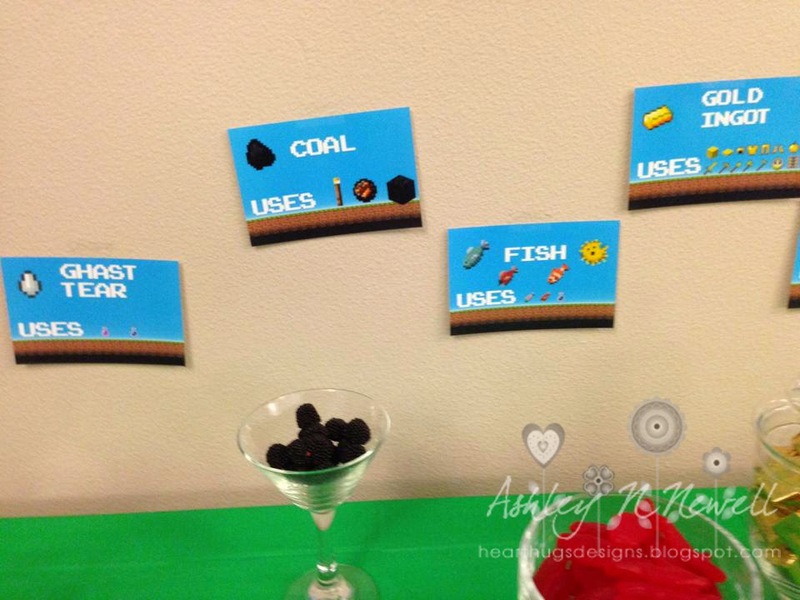 For example, you can use coal and sticks to make a torch. I think. I'm trying to read tiny signs in pictures. 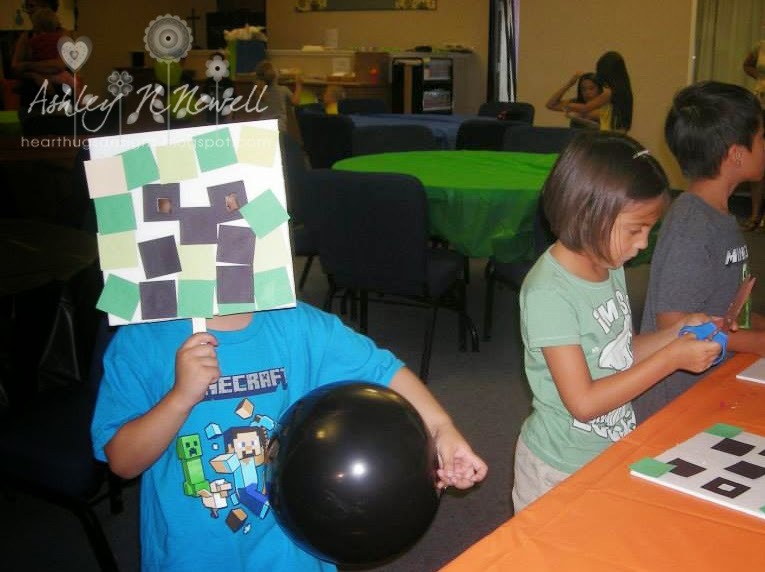 For the party favors, I bought Green Paper Party Favor Bags and colored Creeper Faces on them. The kids got to fill a bag with all the Minecraft "supplies" (aka candy) to take home. Sorry parents but this idea was too good to pass up. 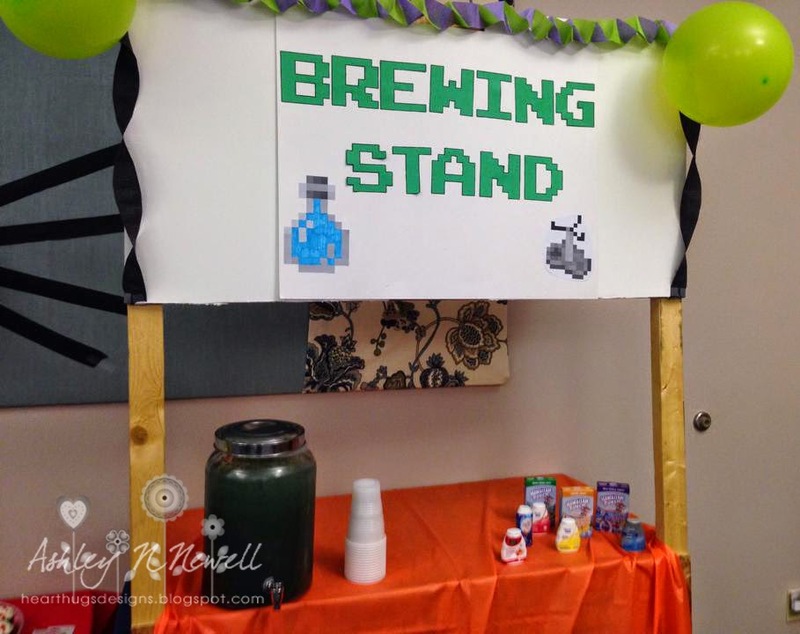 For drinks, we make a Brewing Stand which is a thing in the game. Our friends had made a lemonade stamp for their daughter's birthday and we asked to use it. We covered up the top with poster board and our sign. We added balloons and streams. On the left is "Creeper Aid" which is lemonade with green food coloring. On the right, we have "potions" which were a bunch of those favorings you add to water bottles. We had the drops and the single packet powder things. There was a tub next to this with ice and water bottles. This was a HUGE hit. My bestie Summer made the boys this cake for their birthday gift. She spent DAYS cutting out the little fondant squares and making it all fit. It looked AWESOME! The kids loved this cake! Since the cake only feeds 20, I made some cupcakes to look like the cake in the game. 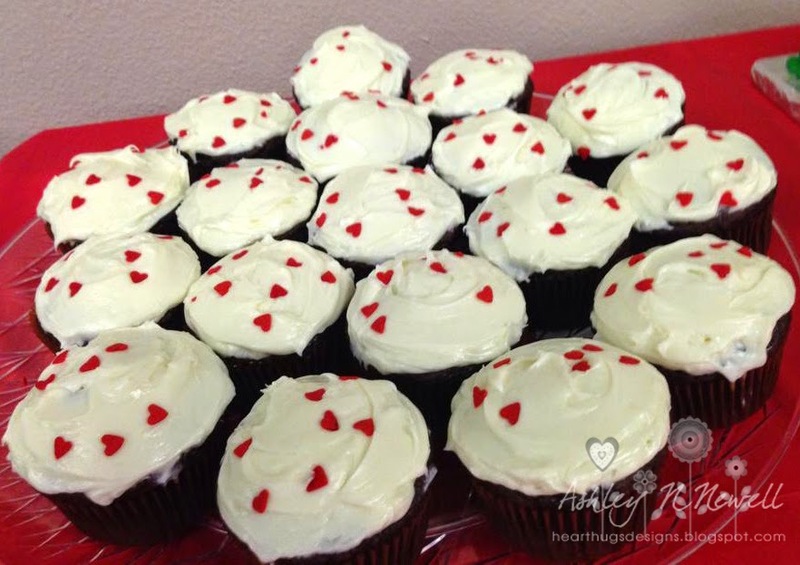 I couldn't find red square sprinkles or candy so I used hearts. No one seemed to mind. 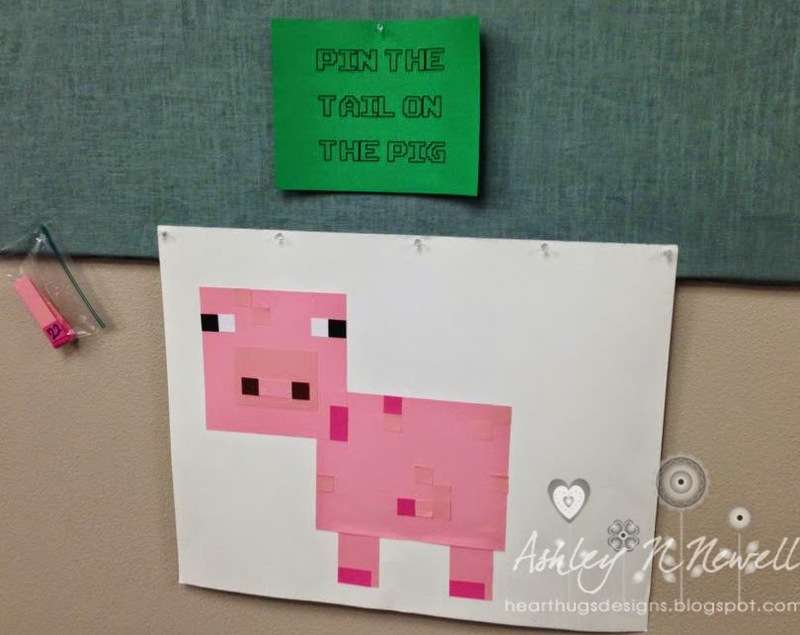 For games, I made a Pin the Tail on the Pig. I just made this out of a poster board and some card stock. You know you love your kids when you pull out your nice Bazzill cardstock for a pig game. I put numbers on the tails and had the kids remember their numbers. We also had a craft station where you could make your own mask. We cut 10x10 pieces of foam board and duct taped tongue depressors to them. I cut out a BUNCH of different colored squares from construction paper and provided glue sticks. D had to sit there and cut out the eye holes with a pocket knife during the party. We also had a contest where a judge picked the best mask and they got a prize. My step brother was in the other room doing homework and he randomly picked the smallest kid to get the prize, it was adorable. We also set up a Photo Booth for the kids. 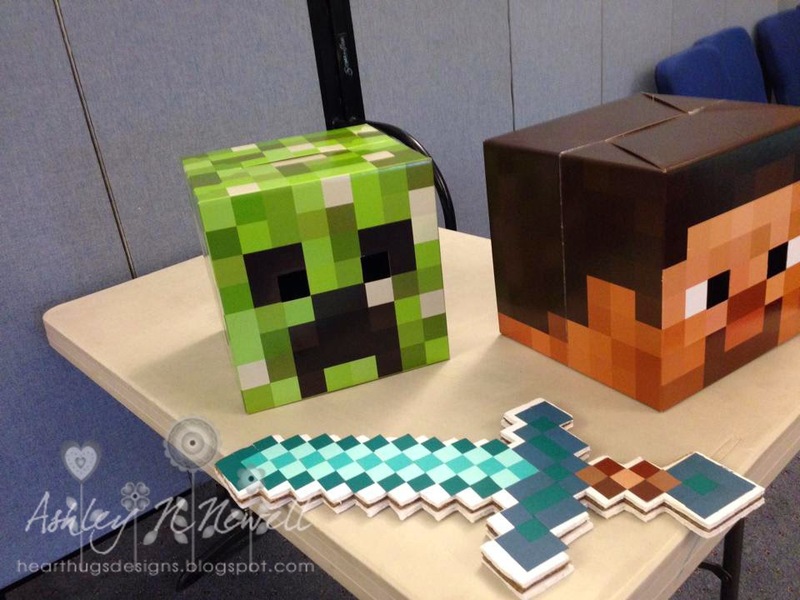 We bought the Minecraft Creeper Head and the Steve Head. 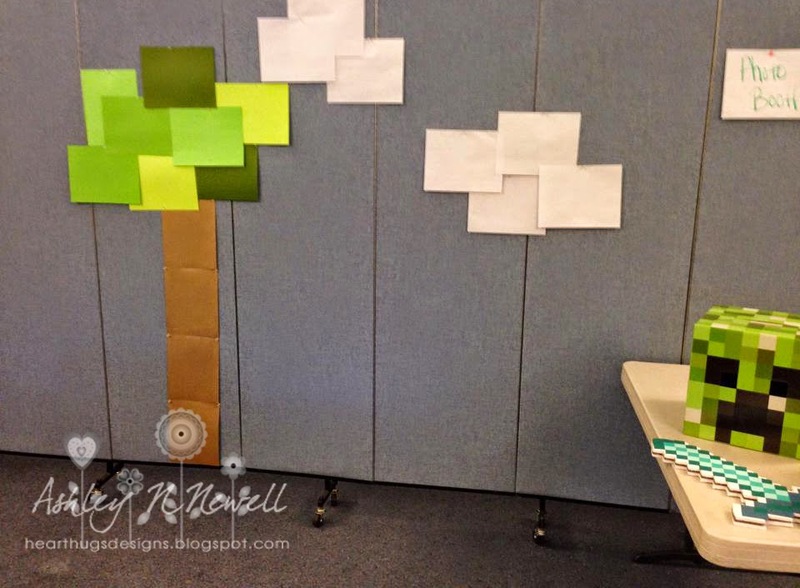 I just used construction paper to make the tree and clouds for the background. 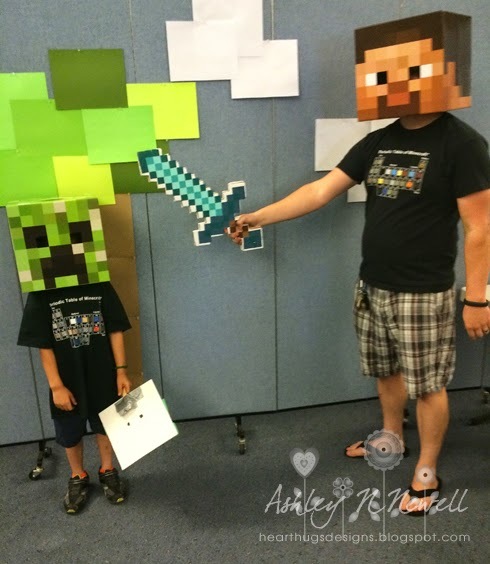 It was the world's easiest photo booth and the kids LOVED it! 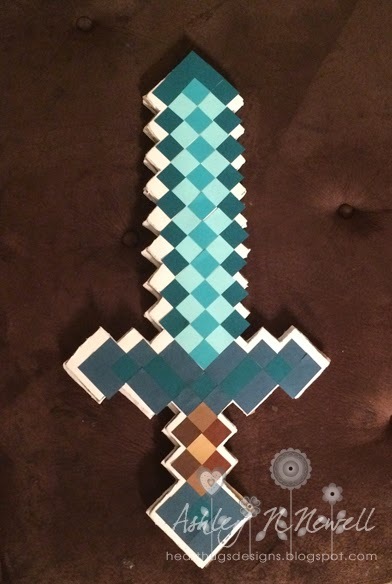 I spent HOURS making this sword because I didn't want to spend the money buying one. It was an extremely frustrating project and I do not recommend it at all. I cut all the squares, Dustin cut the foam then it wasn't thick enough so he had to cut another piece of foam and it was STILL not thick enough so he had to put cardboard in the middle. Yeah, it probably took close to 13 hours to complete. Do yourself a favor and BUY Minecraft Diamond Sword for the $12 instead. Seriously. This is Brady and Dustin in their matching shirts. Teehee! 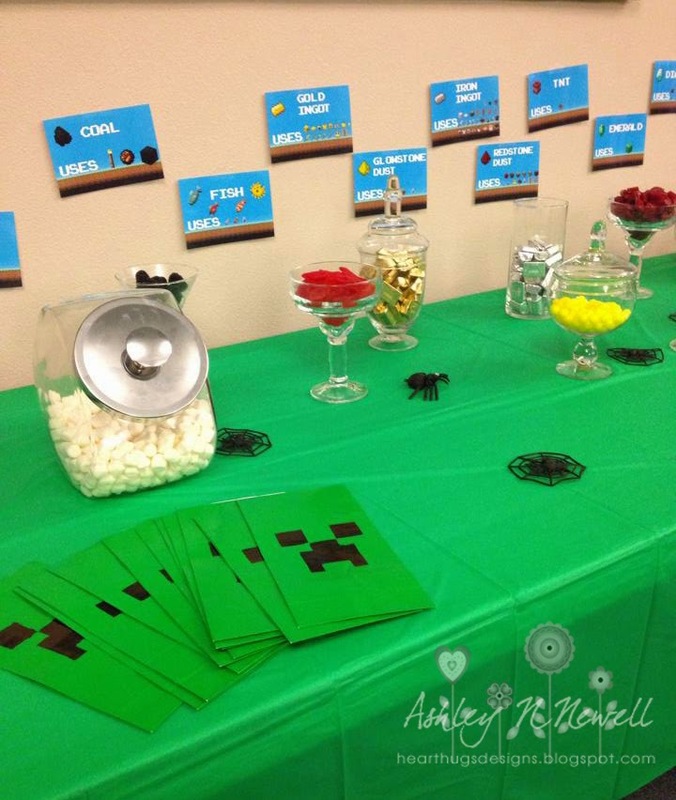 Love all the details of the party-you and Dustin did a great job! 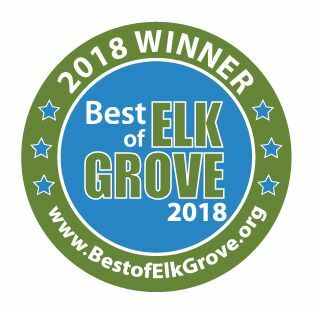 You did a great job! Looks like a ton of fun, and a lot of work!!!! I bet they really appreciated it though!!! That is true dear; selecting a perfect wedding venue is one of the jobs to do with when you are planning your big and special day. I am lucky that I hired halls in Los Angeles and that made me feel really satisfactory.